Only enemies of the virtual world which are not under the aegis of XANA, the Ninjas are new entities which will make a entrance in the heroes' universe through their apparition on the Cortex. 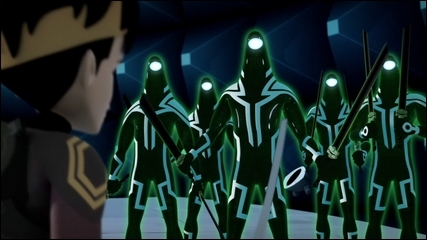 Tyron's agents in the “Virtuality” are almost the exact alter ego of the Lyoko Warriors. 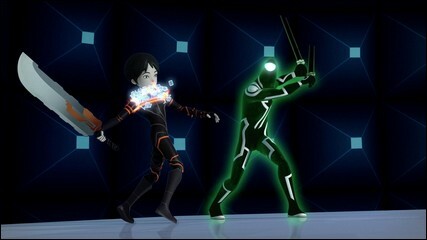 While the Lyoko Warriors are far above XANA's monsters in terms of combat, the Ninjas gave the virtual fighters quite some headaches. Welcome to the page where everything about the Ninjas is revealed. The Ninjas are an exceptional category of virtual beings. They are not controlled by XANA. They obey Tyron but have their own will... and their existence on the virtual world is particularly close to the heroes' one. An explanation! The heroes are virtual avatars generated by virtualized human beings. Let's remember what virtualization is. The scanner of the factory analyzes the body and the mind of the human. It collects information, converts it all into computer data and conceives a virtual avatar from the subconscious. Final stage: the scanner splits the body (dematerialization) and creates the avatar on the virtual world (virtualization). When the outer layer is too damaged, it disappears (devirtualization) and the scanner automatically recovers all the data and reinjects it into the human body it recreates (rematerialization). The monsters are only intelligent programs of the virtual world comparable to the vehicles of the heroes. They virtualize themselves, have their time to shine and are devirtualized (definitive disappearance) when they suffer too much damage. The Ninjas match with a third system, developed by Tyron. At the time Tyron betrayed Hopper, Aelita's father had already conceived the Supercomputer. Tyron could have copied and reproduced the machine almost identically, then created his own virtual world within: the Cortex. In all likelihood, Hopper hadn't thought up the scanners yet when Tyron betrayed him. Tyron doesn't have the technology of virtualization. When the heroes started to nose about the Cortex (or even before), Tyron had few means of defense. He thus had to invent his own process. Tyron's Ninjas are human beings. Probably Tyron's employees: We see him calling them clearly in episode 20 “Espionage”. However, they never appear again for us. They must be available at a moment's notice, because they show up on the Cortex extremely fast when Tyron realizes that there is a great enough need (Episode 18 “Tenacity”) to protect the interface of the Cortex and remove the ultra VMA peripheral devices of the heroes. It also happened once that Tyron used his Ninjas to protect a tower he activated to make the heroes fall into the trap of a time loop (Episode 24 “Temporal Paradox”). The scientist sends them with special outfits. These ones only appeared once. Many mysteries surround them. The most likely scenario is the following one: A human being gets into the outfit. Inside this one, his body and his consciousness are linked to the supercomputer of Tyron. The individual surely loses consciousness and his mind is transfered to a virtual avatar generated by the machine on the Cortex. What differences are there with the two processes of virtualization? Unlike what many people think, the two systems are equal and the outfits of Tyron are not inferior to the scanners in terms of interest (although technologically less advanced). A scanner can manage an infinite number of individuals. The outfit of the Ninja can only contain one body at once. 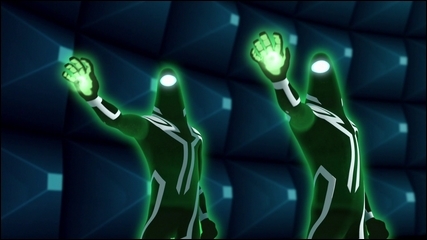 The virtualized heroes keep their personality and obtain a personalized avatar in their own image. The individuals inside the outfits obtain standardized virtual avatars with all the same looks, weapons and powers. Many mysteries still surround Tyron's process. Does every Ninja remain conscious of who he is as a human being? Or does he obtain just for a time the abilities of the human brain of the individual in the outfit? Are the humans' minds projected in the Ninjas safe from the hazards of the virtual worlds? For example, do they wake up if the Ninja falls into the Digital Sea? Or will their mind be lost forever? Are the individuals in the Ninjas' outfits experts at fighting in real life? Or do they gain their martial ability once in the Ninja's body? Can Tyron devirtualize his Ninjas himself? Will he be able to upgrade them like Jeremy did with his warriors? In conclusion, we can say that the alternative process created by Tyron to act in the virtual world is the illustration of his intelligence. Even deprived of scanners, the scientist showed some genius which has little to envy from Hopper's one. The Ninjas have a phenomenal martial ability and from all points of view. At first, they are powerful. Their double short sword is a virtual weapon. Although standard, a well-hurled hit is sufficiently devastating to get the better of a virtual shell in one shot. The pairing of the weapon also means that the Ninjas have an excellent ability at close combat: in all sports of the sword, the double weapons permits a mix of attack and defense in superb combinations. The Ninjas have no trouble in warding off Ulrich's assaults or even Yumi's fans. Combined with their strength, the Ninjas also are efficient at hand-to-hand combat. They dodge and return hits with an impressive speed. Ulrich bears the brunt of it during his first fight against them (Episode 08 “Virus”). Even William, the most powerful of the group at hand-to-hand thanks to the combined use of his strength, his sword, and his Supersmoke, still loses his duels facing the Ninjas (Episode 14 “Intrusion”). 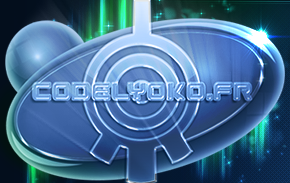 Additionally, like the heroes (in Code Lyoko Evolution), they have incredible physical strength. They are able to take huge jumps and land on their legs with no problem at all. And even their physical hits are destructive: Odd is being one-shotted with a violent kick (Episode 14 “Intrusion”). With their strength comes speed. The Ninjas are brisk. They are able to cover great distances quickly... So they can hurl fast and deadly hits, even when they're going to be devirtualized (Episode 16 “Confusion”). 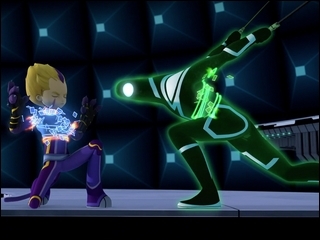 The most impressive fact is the Ninjas' ability to ward off even the bursts of Odd's laser arrows! Last crucial point, the Ninjas are clever. If XANA's monsters are basic programs, the Ninjas are humans. They aren't fooled as easily as XANA's monsters. They adapt to situations, they anticipate and they react. They show discretion and use their powers to their best ability to surprise the heroes and meticulously get rid of them. Sudden appearance, surprise stab, everything. During combat, this changes everything. The only way to defeat them is to surprise them with being unpredictable and crafty (Episode 10 “The Warrior Awakens”). The use of these powers like Supersprint (Episode 16 “Confusion”) or Triplicate (Episode 14 “Intrusion”) is often useful to defeat them. There's just one fault, because nobody's perfect. The Ninjas have few life points. Their resilience is lower and consequently, the least of hits quickly gets the better of them. 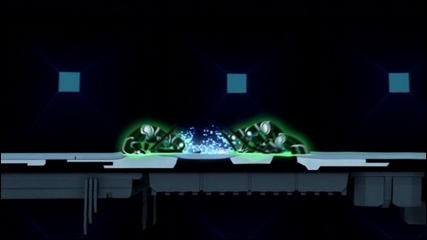 However, this weakness might be the only element that makes them vulnerable still against the Lyoko Warriors. This weakness may come from the different processes between the virtualization by scanner, which splits the body to create an autonomous virtual avatar, and Tyron's process, which just links the human mind to a virtual shell. The Ninja has a frightening power. They can phase through any element of their surroundings. This allows them to merge into the ground, walls and ceilings. Thanks to this ability, they can make discreet and surprising entrances. It also allows them to move without being discovered and even to dodge some attacks. At last, the crucial point: they can disappear with style by infiltrating into the ground once their dirty work is done. 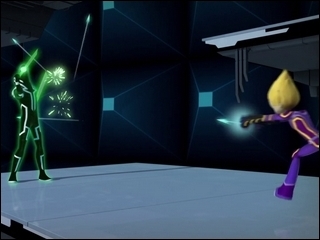 A more unique power is the one that two Ninjas unleashed against Aelita and Yumi in episode 16 “Confusion”. With the help of a green beam of “encoders”, they were able to immobilize the two young girls. A prolonged exposure to this beam would, according to Aelita, have permitted the Ninjas to “block them in the virtual world”. Jeremy will however intervene just in time. The exact definition of the effect of this power remains difficult to define. Does it lead to a definitive virtualization like when falling in the Digital Sea? Or is it something else...? We don't know. It remains to be seen whether there are other powers but that had been used by only one Ninja. In episode 14 “Intrusion”, Tyron works out a plan of attack. The Ninjas simulate an overwhelming defeat in the core of the Cortex. 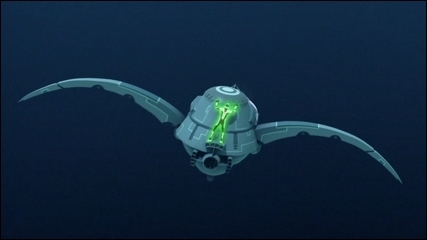 But it is just a diversion to allow one of them to follow the heroes, to cling onto the Skidbladnir, and to reach Lyoko to set down a transmitter. 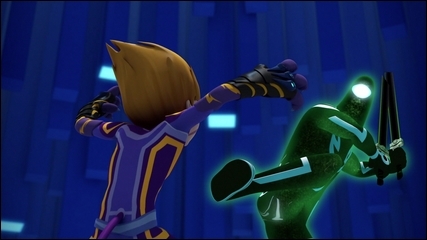 Moreover, note that it is the only time that Tyron uses a Ninja to go on the offense and not for the defense of the Cortex. Also the only time that a Ninja ventures far from the core of the Cortex. This Ninja is relatively atypical, because in one episode, he deploys a display of powers that his teammates will not use, despite their great use. At first, he has the gift of being invisible. 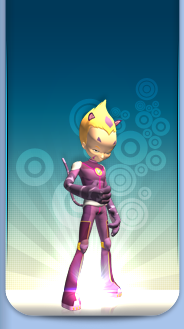 It allows him to track the Lyoko Warriors without being seen, even by Jeremy. This power seems difficult to maintain for the virtual wretch, because he needs some rest to reactivate it. He then uses a sort of Supersprint in Ninja form. The fact that he can chase the Megapod makes him out to be a faster Ninja than his teammates, even if it isn't proved logically. Last element: Clutched to the Skid, the Ninja survives in the world network, despite the huge pressure of the Digital Sea which crushes the computer bodies in the flow of data. This element is noteworthy because few things have survived in the Digital Sea: XANA and Hopper (As a reminder, the two most powerful entities of the virtual world...), and the virtual bodies especially made for it (namely the Skid and the submarine monsters...). Many explanations are to be contemplated. We can either voice the hypothesis that the Ninja was protected from the Digital Sea by a field spread by Tyron (the same field that made him invisible?). We can also attribute this resilience to the particular process that Tyron uses to send human minds as the shells of Ninja. 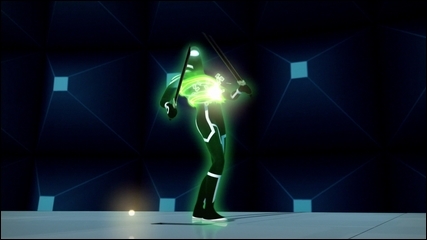 The link between the mind and the virtual avatar may be stronger and as the Ninja maintains an anchor on Earth (the human brain contained in the outfit used for tranfer), the Ninja's avatar would be stronger than a virtualized Lyoko Warrior and would avoid being digitally dispersed... All of this only remains as speculation. Last possible explanation: the Ninjas may all have the ability to survive a digital dive. 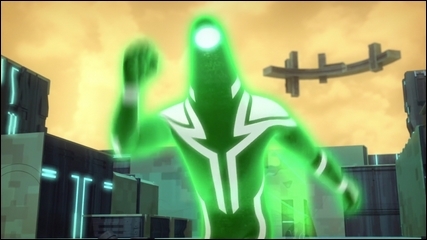 After all, Mantas proved some episodes later (Episode 18 “Tenacity”) that a monster can be hybrid: Evolve at the same time in the network and in the virtual worlds. The fact remains that this Ninja remains atypical in comparison with his teammates.